No other council members have signed onto Kshama Sawant's call, and she needs at least two allies to advance the idea in budget talks. When Seattle leaders repealed their controversial head tax on large businesses, they had no plan to replace tens of millions of dollars the measure was supposed to raise annually for housing and homeless services. Months later, they still have no plan, City Councilmember Kshama Sawant said Wednesday, calling attention to the issue as the council reviews Mayor Jenny Durkan’s proposed 2019 budget. At a news conference with housing activists but no other council members, Sawant said her colleagues should either revisit what she called the “Amazon tax” or make up the money by cutting elsewhere in the budget. Durkan’s office didn’t immediately comment on the concept. Seattle could raise $48 million with actions such as slowing police-officer hiring, shedding executives, capping executive salaries at $150,000, eliminating other vacant government jobs, not putting new computers in police cars and ending “sweeps” of homeless encampments, Sawant said. Her office provided scant details, describing the trims as loose options that would be refined moving ahead. Durkan’s budget calls for hiring 104 officers next year, with 75 expected to depart. Sawant would dramatically reduce the number of hires, staffer Ted Virdone said. Ending encampment sweeps would mean doing away with the city’s Navigation Team, a collection of police officers and outreach workers, Virdone said. Sawant was joined Wednesday by representatives from organizations including the Tenants Union of Washington State, the Real Change Homeless Empowerment Project, the Democratic Socialists of America and the May 1 Action Committee for El Comité. No other council members have signed onto her call, however, and she needs at least two allies to advance the idea in budget talks. “It’s not rocket science. 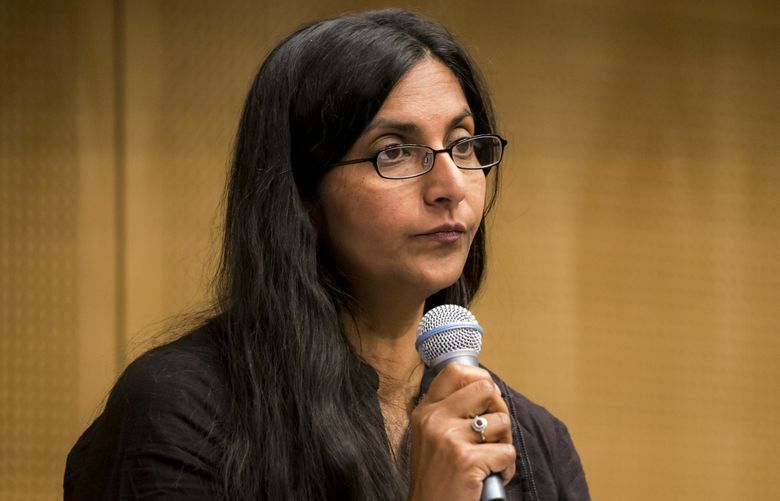 It’s political will” that’s needed, said Sawant, one of two council members who voted against the head-tax repeal in June. Juan Jose Bocanegra, with the May 1 Action Committee for El Comité, said Seattle needs to overhaul its tax structure and create more low-income housing because people of color and immigrants are being priced out of the city to suburbs less equipped to help them.